In Irish Ellen is Eibhlín (Evleen), it is a nice sound. The ending ín is the diminutive form, for little people. How appropriate for this child who died so young. She was clearly named after her mother. Ellen, Thomas and Ellen’s third daughter, was born in Ballyduff in 1847. She was baptised on 25 April in the village church. It is possible that she died very soon after her birth because the winter of 1846-7 was one of the worst in memory and Ireland was in the grip of a terrible famine. She did not go to London with her parents; she disappeared from the records. Deaths were not dealt with as diligently as births and marriages in the parish registers, particularly in those years when thousands and thousands of people were dying. Ellen was a tiny mite and it is probable that Thomas and Ellen, her mother, had struggled to feed their family and keep them warm under the awful conditions. They were relatively well off as valued artisans and had an honourable landlord, so imagine what it was like for those less protected. Perhaps Ellen lasted longer than I just said and her death may have been the final straw for Thomas and Ellen, causing them to leave their home for England in 1850-1. We will just never know. In the 19th century all classes were vulnerable to outbreaks of whooping-cough, cholera, typhus, dysentery, influenza, smallpox, measles and many other illnesses which were later prevented by vaccination. Life expectancy was very low compared to today. I have read that in the early 1800s a male’s average life span was 38 years. Our next generation, Thomas and Mary, lost three of their seven children, Mary, Thomas and Gwendoline, within two years of their births, the girls within a few months. I have written about the famine years, 1845-49, before but 1847 was so central that it is worth repeating some of the history. The potato crop completely failed in 1845 & 1846. In ‘Black’ 1847 as it is known, there was a potato crop, but only twenty five percent of normal; however there was a good grain crop. A laissez-faire trade policy was being followed by the Westminster government. This allowed the local good quality grain crop to be exported by absentee landowners rather than it being used to feed the people, while the government was importing American maize, but leaving it to the local merchants as to how it was distributed. Only in west Cork, Kerry and Donegal did direct intervention take place. The result was that there just was not enough accessible food in Ireland and the people were weakened by the two prior years’ shortages. The iconic picture on the left is from the Illustrated London News in 1847. 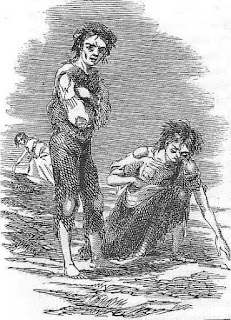 They sent illustrators to Ireland and began publishing pictures of famine victims, raising awareness of the unfolding catastrophe in the rest of Britain. The government's efforts were concentrated primarily on creating employment and paying people so that they could buy their own food. But the cost had to be met through local rates. The pay was low and not nearly enough to support a family. However, three quarters of a million people had signed up to the work schemes (such as building roads) by March of 1847. The workhouses, set up in the previous decade for those who could no longer afford to support themselves, were feared. But by the end of 1846 they were full. Private charity was responsible for keeping hundreds of thousands of people alive in the winter of 1846 to 1847. Catholic priests organised food. Funds were raised in Britain and America to buy and ship maize and to buy food boilers (for soup kitchens). Clothes were also brought in as many of the local people had pawned their winter clothes to buy food. In the summer of 1847 the government scrapped the relief programmes and began to organise full-scale food distribution. By the end of the year imports of grain finally exceeded exports. So Ellen was born into the worst year of the famine and was almost certainly a casualty. Mary Ann is the first O’Donoghue of our direct family line to have been born in England. She was born on 20 March 1852 in Poplar and baptised on 16 May at St Mary & St Joseph’s, the family church. She would have been educated at the Wade Street School. In 1861 she was with her mother in Mary Street and in 1863 was godmother to her cousin Catherine Carrington at the age of 11. Today the minimum age in the Catholic Church for godparenting is 16; I have been unable to ascertain if this was different in the 19th century. This is so young that it makes me wonder if there was another family member called Mary Ann, whom I have not yet identified. By 1881 Mary Ann was a domestic servant living with her elder sister Julia in Market Street. 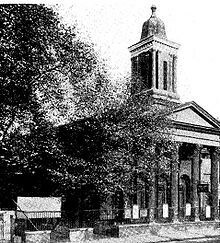 On 20 July 1882 she married William Thomas Rochester in Trinity Independent Chapel, Poplar. Built in 1841, this was of the Congregational or Methodist denomination. It was on the corner of East India Dock Road and Augusta Street and is described as very architecturally significant with its large elegant frontage. Our family was staunch Roman Catholic in those days and yet Julia and Mary Ann were married outside of that faith: Julia in an Anglican church and Mary Ann in a Methodist one. Siblings Catherine and Thomas were both married in the Catholic St Mary & St Josephs. This was the start of the family’s withdrawal from the Catholic faith which continued for some in the next generation as my grandmother was a protestant. Allow me a theory. Normally the woman would choose the church. I suspect Julia was diverted by her husband John, who was a Protestant, and that Mary Ann, being very close to her 18 years older sister, chose an alternative because of her. Alternatively the Rochesters were Methodists. Perhaps the future husbands’ families held sway on these choices. At the time of the marriage William Rochester was 30 years-old and Mary Ann 29 – quite late by the standards of the day. His occupation is described as commercial traveller and he was living in Brockley, Kent. His father was a Richard, an accountant. What this occupation really meant we can only surmise, but the accounting profession was formalising its structure around this time; it could mean anything from a bookkeeper/clerk to a forensic accountant. are a bit of a mystery. I looked for William, born in 1852, in the 1881 census. There is one boarding in 66 High Street, Lambeth, born in 1854, whose occupation is shown as general labourer. But I don’t think you could go from a general labourer to commercial traveller in one year. I looked for Richard, his father, back over the decades and there are certainly no accountants. I am very suspicious that there is a lot of dodgy data here and I could find no records that really gelled. On their marriage certificate the residential addresses were transposed which does not fill one with confidence. So I am going to move on and perhaps come back to the Rochesters at a later date…I get bored easily! In 1883, William Charles Herman Rochester was born. Why Herman? This is a German name. Is there a clue in there somewhere? Mary Ann, now calling herself Marian or Marion, was living at 20 Rowlett Street, Bromley, Poplar. William, the father, has become a mariner. Rowlett Street was east from Chrisp Street at the end of Grundy Street. Bernard Francis Rochester was born in 1886 in 155 Brunswick Road, Bromley. Marie Gertrude Rochester was born in 1888 at 37 Hind Street, Poplar with Mary Ann’s sister, Catherine, present at the birth and William is shown as a merchant seaman. By 1891 the family had moved to 88 Caister Park Road, Plaistow,West Ham, which they shared with another family. William, the father, was not at home, at sea no doubt. However by 1901 he was dead as Marian is described as a widow living at 21 Moreton Road, West Ham. Caister Park Road is just off West Ham Park, a very historic place, as are most of London’s parks. In 1873, a petition of inhabitants of West Ham and Stratford was received by the City of London (the City) asking for assistance in the purchase of the Park for preservation as an open space. The City agreed to grant the sum of £10,000 for the purpose. Mr. John Gurney, a grandson of Mr. Samuel Gurney, who had inherited the estate in 1812, was at that time the owner of the Ham House Estate, which was 77 acres in extent and valued at £25,000. He and other members of his family jointly contributed £10,000, the City duly paid £10,000 and the remaining £5,000 of purchase money was prescribed locally. West Ham Park was officially opened on 20 July 1874. The City undertook to maintain the Park forever at its own expense. The public park was laid out by 1887, incorporating features from the earlier park including the pleasure gardens, mature trees, and the carriage drive. The picture to left is The Terrace in 1904. I have not managed to find Mary Ann in the 1911 census. Perhaps she married again but I have not found a marriage that fits or a death in the name of Mary Ann Rochester. In 1891 he was living with his mother in West Ham. By 1901 his father had died and he was shown as head of the household, at age 18, with the occupation of incandescent (light bulb) fitter. At some point before 1911 he became a soldier in the Royal Marine Light Infantry. 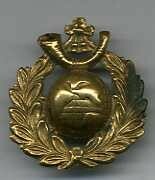 The Light Infantry were merged with the Royal Marine Artillery in 1923. Left is the cap badge at that time. This is the territory that we learnt about at school as the North West Frontier (of Khyber Pass fame). William was there between the Second Afghan War which ended in 1880, in which red-coated British soldiers were perpetually ambushed by local tribesmen, and the Third which started in 1919. Nothing much has changed in terms of conflict! Quetta is now in Pakistan, however. In 1908 William may have taken part in two expeditions against the Zakha Zel and Mohmand, two great Pashtun tribal groups. He appears to have left the army sometime between 1911 and 1915, when he re-enlisted in the 1st Battalion of the Essex Regiment as a sergeant. 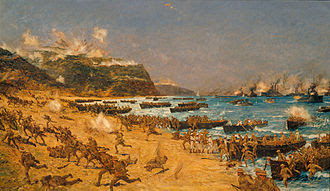 The 1st Battalion took part in the Gallipoli Campaign disembarking on 25 April at Cape Helles. This picture shows the landing. They were engaged in heavy fighting. William was wounded on the 2 June. 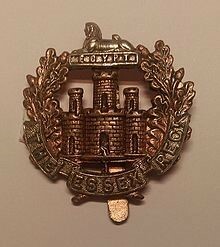 This campaign was a complete failure and the battalion was evacuated on 8 January 1916, moving to Egypt. On the 16 March they sailed from Alexandria to France. The 1st Battalion took part in the first day of the Battle of the Somme on 1 July 1916. The battalion took up position in the British trenches at 3:30 am. 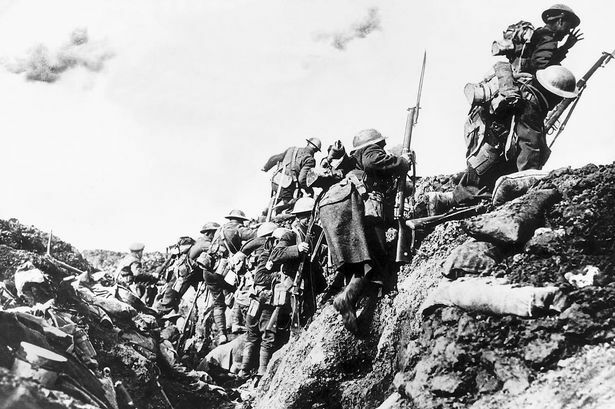 At 8:40 am, the battalion received orders to advance and clear the German first-line trenches. It was delayed by heavy enemy fire and congestion in the communication trenches. The Newfoundland Regiment advancing to the left of the Essex battalion was almost entirely wiped out as it advanced towards the German lines. At 10:50 am, the Essex companies were in position and received orders to go ‘over the top’. They came under heavy artillery and machine gun fire almost as soon as they appeared over the parapet, causing heavy losses. The attack became bogged down in no man's land. The battalion received orders from 88th Brigade headquarters to recommence the attack at 12:30 pm, but at 12:20 pm the battalion commander advised brigade HQ that ‘owing to casualties and disorganisation’, it was impossible to do so. The survivors of the battalion received orders to hold their position along the line of 'Mary Redan' – 'New Trench' – 'Regent Street'. On that first day alone the British Army lost 57,470 casualties, of whom 19,240 men were killed. William saw out 1916 but was wounded again on 23 April 1917. He received the 1914-5 Star, Victory and British medals and appears to have survived the war or, at least, I have not found a record of his death. Bernard also joined the army in the 2nd Battalion Essex Regiment in 1904. He was almost immediately shipped to Malta. In that year 55% of the regiment contracted a ‘simple continued fever’. On 4 February 1905 Bernard died of what was then called Malta Fever or brucellosis. It does not actually name this fever but it seems a reasonable assumption. Here is a record of his death. Also known as undulant fever, Gibraltar fever, Bang's disease, or Mediterranean fever, brucellosis is most likely to occur among those individuals who regularly work with livestock. The disease originated in domestic livestock, on Malta in particular, goats. In humans, brucellosis continues to be spread via unpasteurized milk obtained from infected cows or through contact with the discharges of cattle and goats. In areas of the world where milk is not pasteurized, for example in Latin America and the Mediterranean, the disease is still contracted by ingesting unpasteurized dairy products. Apparently, on Malta, the local farmers used to walk their goats from customer to customer, milking them at each place. The effect of the disease on the British army in Malta was such that up to the middle of 1906, the garrison of Malta lost annually the services of some 650 soldiers and sailors for a period of 120 days each, making a total of some 80,000 days of illness. Soldiers suffering from the disease had an average stay in hospital of nearly 90 days within a range of 15 days to two years and although the mortality rate amongst the military was low at around 2%, the mortality rate for civilians on Malta was much higher. Bernard was clearly very unlucky. Poor Mary Ann. 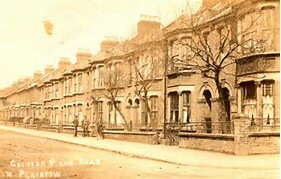 Marie was with her mother and brother in 1901 but by 1911, like her mother, I can find no trace of her, until her death on 26 October 1918 at 135 King’s Road, Brighton. By then she was known as Elsie Marie. 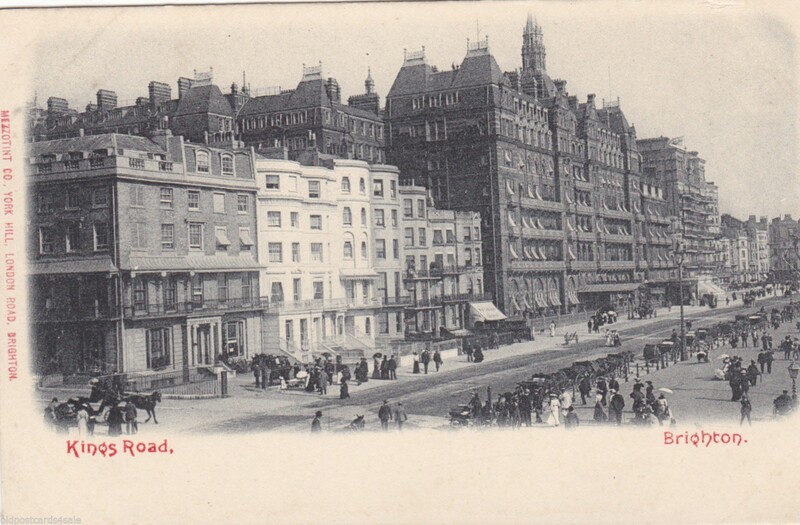 She was working as a chambermaid in a hotel, perhaps one of the ones in this picture. Mary Ann was present at her daughter’s death. She died from influenza which brought on pneumonia. The ‘Spanish Flu’ pandemic of 1918 was one of the greatest medical disasters of the 20th century. This was a global pandemic, an airborne virus which affected every continent. It was nicknamed ‘Spanish flu’ as the first reported cases were in Spain. As this was during World War One, newspapers were censored (Germany, the United States, Britain and France all had media blackouts on news that might lower morale) so although there were influenza (flu) cases elsewhere, it was the Spanish cases that hit the headlines. One of the first casualties was the King of Spain. Although not caused by World War I, it is thought that in the UK, the virus was spread by soldiers returning home from the trenches in northern France. Soldiers were becoming ill with what was known as ‘la grippe’, the symptoms of which were sore throats, headaches and a loss of appetite. Although highly infectious in the cramped, primitive conditions of the trenches, recovery was usually swift and doctors at first called it ‘three-day fever’. The outbreak hit the UK in a series of waves, with its peak at the end of WW1. Returning from Northern France at the end of the war, the troops travelled home by train. As they arrived at the railway stations, so the flu spread from the railway stations to the centre of the cities, then to the suburbs and out into the countryside. Not restricted to class, anyone could catch it. Young adults between 20 and 30 years old were particularly affected and the disease struck and progressed quickly in these cases. Marie was 30. Onset was devastatingly quick. Those fine and healthy at breakfast could be dead by tea-time. Within hours of feeling the first symptoms of fatigue, fever and headache, some victims would rapidly develop pneumonia and start turning blue, signalling a shortage of oxygen. They would then struggle for air until they suffocated to death. Hospitals were overwhelmed and even medical students were drafted in to help. Doctors and nurses worked to breaking point, although there was little they could do as there were no treatments for the flu and no antibiotics to treat the pneumonia. During the pandemic of 1918/19, over 50 million people died worldwide and a quarter of the British population were affected. The death toll was 228,000 in Britain alone. This project has been a bit frustrating. I would like to know more about William Thomas Rochester’s family, but have hit blockages. And Mary Ann, by 1918 she had lost two of her three children. Did she re-marry? When did she die? What happened to her first child, William Charles, after WW1?